Invite your friends, family & colleagues into a mesmerizing world where creativity abounds. Over 100 people have made this event possible and we need your participation to make this one of San Diego’s most talked about experience and event. RSVP to any event by emailing [email protected] or visit www.surveyselect.org. Survey Select features 65 world class artists and a inspired programming line up. You can learn more about this amazing event and how you can get involved by visiting www.surveyselect.org. 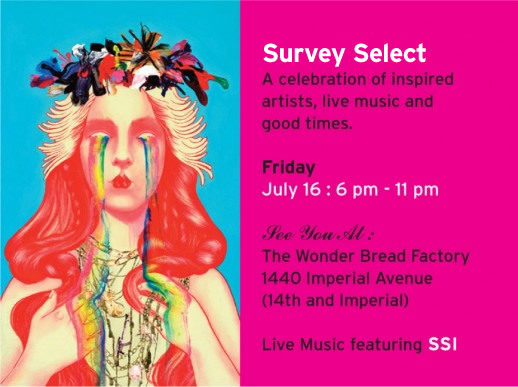 Survey Select Public Reception will start at 6PM – 11PM on July 17th, 2010 at the following location: Wonderbread Factory – 1440 Imperial Ave at 14th & Imperial, San Diego CA 92101. All of the events listed below are open to the public—near and far—perfect for students of the arts, great for networkers and essential for the creative minded. “Citizens of the world unite,” as we look to share an amazing line up offered by many kind sponsors and kind patrons just like you.